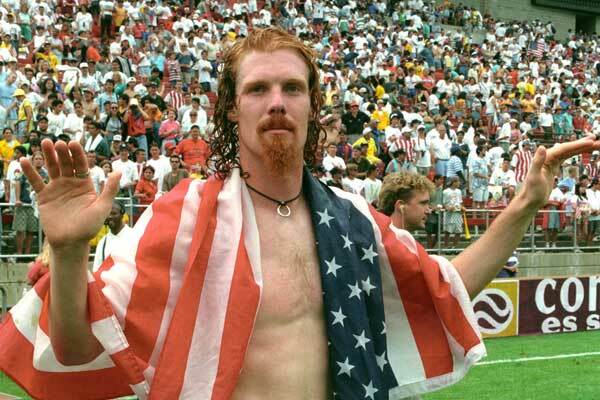 Arguably the most recognizable man in USMNT history, Alexi Lalas has proven on the field that he deserves the popularity he receives off of it. A stalwart on the U.S. back line for over five years, Lalas also became the first American to ever play in the storied Italian Serie A when he signed with Padova in 1994. After nearly 100 appearances with the full national side, Lalas has secured his spot among the all-time American greats. He was most widely known in his prime for his long, fiery red hair and similar goatee. A Hermann and MAC Trophy winner with Rutgers in 1991, Lalas emerged from the 1994 World Cup as one of the faces of American soccer - the first contemporary American player to sign with a Serie A club. Lalas made his National Team debut on March 23, 1993 against El Salvador, scoring the first of his career nine goals five months later against Colombia. He made his first World Cup roster in 1994, using that platform to become a mainstream celebrity. A critical part of the US run in the 1995 Copa America, Lalas was a regular on the team through qualifying for the '98 World Cup and the 1998 Gold Cup where the United States lost to Mexico in the final. Though he made the roster for the finals in France, he did not play. His last cap came against Scotland on May 30, 1998. At club level, Lalas was an obvious signing as the reigning Chevrolet and Honda player of the year when Major League Soccer began signing players in 1995, officially joining the league on June 25, 1995. Lalas would spend the 1995-96 season with Padova, joining in MLS in late February. Only four years into his MLS career (two years with the New England Revolution, one with the Metrostars, and one with the Kansas City Wizards) Lalas announced his retirement. After spending the 2000 season working commentary and concentrating on music, Lalas returned to MLS with a new club, the Los Angeles Galaxy. During the second stage of his career, he became the lynchpin in a Los Angeles Galaxy squad that won the 2001 Confederations and US Open Cup. The Open Cup win was punctuated by Lalas' run up a hill behind the goal at Cal State Fullerton's stadium after the Galaxy scored. In 2002, Lalas won his first MLS Cup, with the Galaxy beating the New England Revolution 1-0 at Foxborough in front of 61, 316 fans - the largest crowd ever for an MLS final. Lalas retired at the end of the 2003 season, surprising many in the US soccer community when he returned to MLS as the general manager of the San Jose Earthquakes. Though quality on the field, the Earthquakes had trouble drawing fans to their home games at Spartan Stadium. Lalas left for another Anshutz Entertainment team, the Metrostars midway through the 2005 season becoming their president and general manager. Before the 2006 season, the Earthquakes had moved to Houston, becoming the Dynamo, and the Metrostars had been sold to the owners of Red Bull energy drink, taking the name Red Bull NY. Lalas left the revamped Red Bulls to become the president and general manager of his old club, the Los Angeles Galaxy after the sudden death of club president Doug Hamilton. 2006 was a busy summer for Lalas, not only setting up shop with a new club but also serving as studio pundit for the 2006 World Cup broadcasts and being announced as a member of the National Soccer Hall of Fame class of 2006. In 2007 things got even busier as the Galaxy signed David Beckham, and Lalas and his quotes were rarely out of the soccer press. Lalas left the Galaxy in August, 2008 and has been working as a studio commentator for ESPN's soccer coverage. Still involved in music, Lalas was known for keeping a guitar in his office. 2002: Appeared with the US National Team at MLS All-Star game. 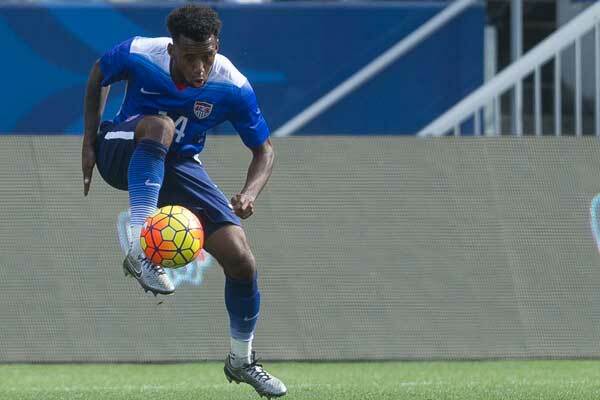 1997: USA leader in minutes played for the second consecutive year. 1996: Played every minute of every match at the summer Olympics as one of the over-age players. 1995: Named to the 1995 All-Copa America Team. 1995: Played in every match in the Copa America, helping the U.S. reach the semifinals. 1995: Named 1995 U.S. Soccer Male Athlete of the Year. 1994: Played in every minute of every U.S. match at the '94 World Cup. 1993: Broke through with the USMNT when he scored the game-clinching goal in the USA's 2-0 victory over England in the 1993 U.S. Cup. 1993: Scored his first goal for the national team on May 8, 1993 against Colombia. 1992: Played in the USA's 2-2 draw with Poland at the summer Olympics despite suffering a broken foot one week prior to the start of the games. 1990: Made his international debut on May 6, starting against Canada. 2004: Became the first former MLS player to be named General Manager of a team with his appointment as San Jose Earthquakes general manager. 2003: Played 22 games, starting 19 for the Galaxy. 2002: Started 2002 MLS Cup and helped Galaxy win their first MLS championship. 2002: Started 26 games and registered a career-high four goals and four assists. 2001: Was part of the Los Angeles Galaxy squad that won the Confederations Cup championship and the U.S. Open Cup title. 2001: Returned to soccer by signing with the Los Angeles Galaxy of MLS on January 16, 2001. 2000: Announced his retirement from professional soccer. 1999: Joined the Kansas City Wizards of MLS and scored a career-high four goals in the season. 1998: Played with the New York/New Jersey MetroStars. 1997: Loaned to Emelec of the Ecuador first division, where he played in 10 matches. 1996: Voted to the inaugural MLS All-Star game. 1996: Joined the New England Revolution. 1994: Made professional debut with Padova of the Italian Serie A on July 27, 1994.